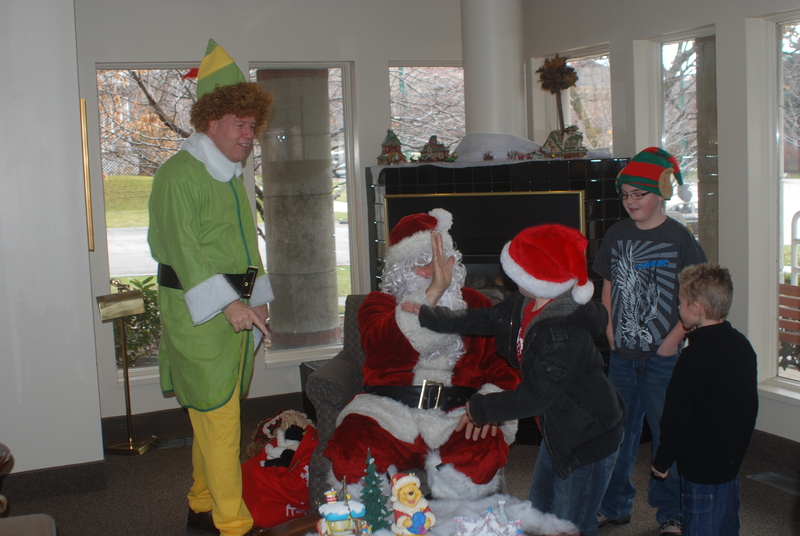 Since 2012, Buddy the Elf and Santa Claus have collected tips during their excursions throughout Utah, including Temple Square in November and December during the Christmas season. 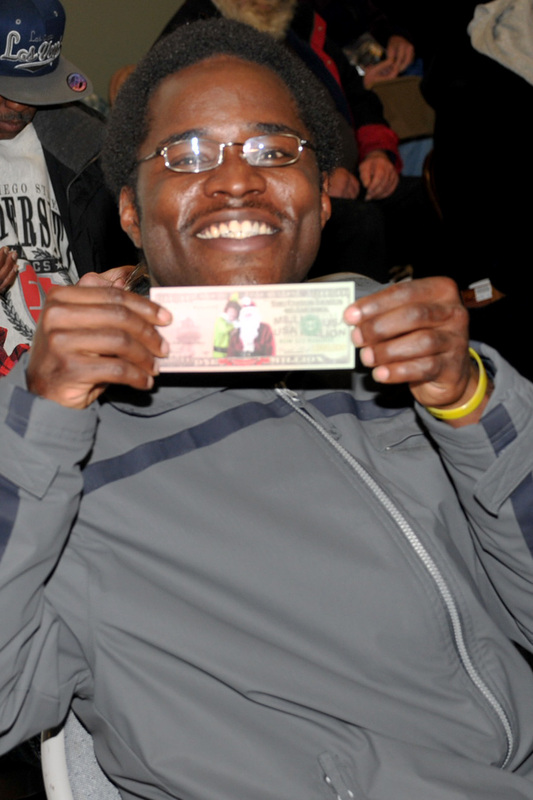 About 25% of those who take pictures with us give us anything from a few coins to a dollar or two; in 2015, we received our first $100 bill donation! We want you to know that 100% of all monies put into the orange bucket is returned to the Utah community. Here are some pictures along with explanations to explain what we do with the funds! 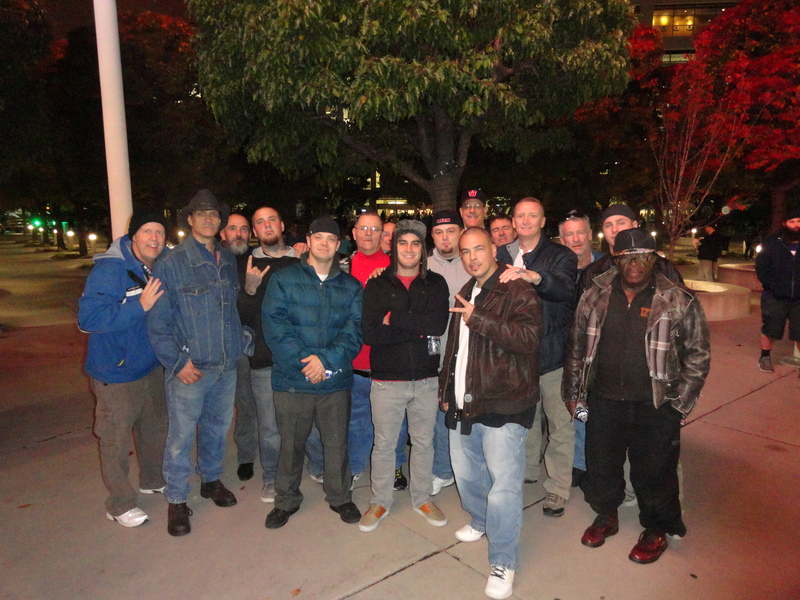 Above are some of the men in the Salt Lake Rescue Mission program just before the home NBA basketball opener for the Utah Jazz in 2015. The Rescue Mission has a wonderful program ion place that assists the homeless who have the desire to get off the street. Their goal is to make them self sufficient, all in the name of Christ. Buddy and Santa are big supporters of this ministry. Each of the men received a snack pack and a ticket to the game, thanks to your donations! 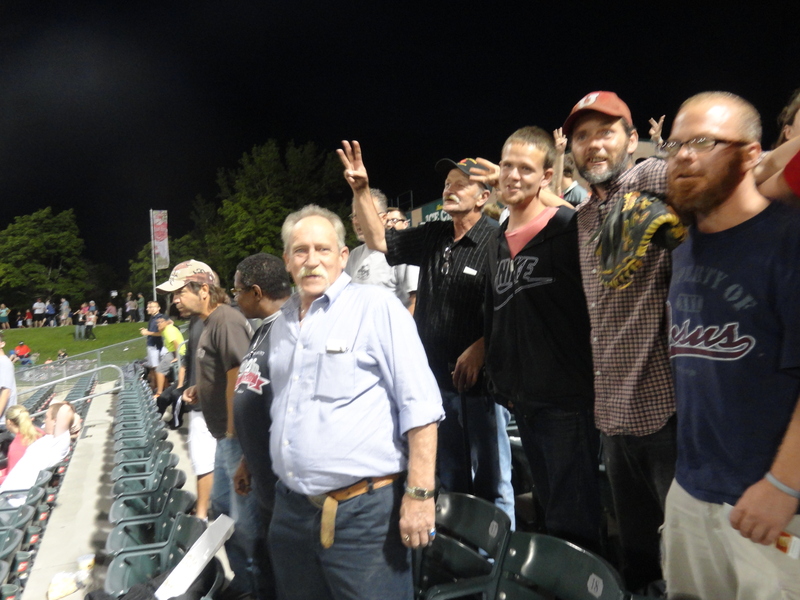 Below are pictures taken in 2014 across the street from a Salt Lake Bees baseball game. Each of the men in the program received a snack pack that included a Bible, money for food at the game, candy, and a ticket. At the right we are singing “Take me out to the ballgame” during the 7th inning stretch time. 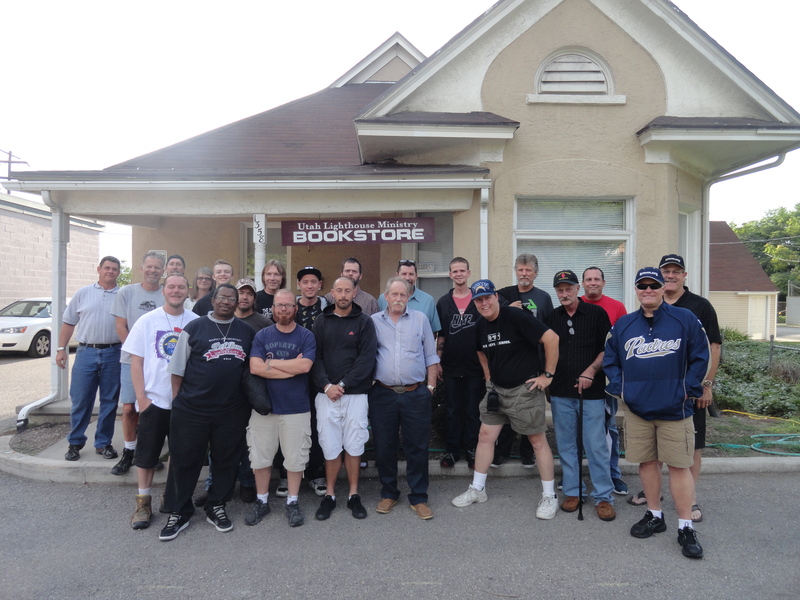 Below are pictures taken in 2014 at the Rescue Mission. 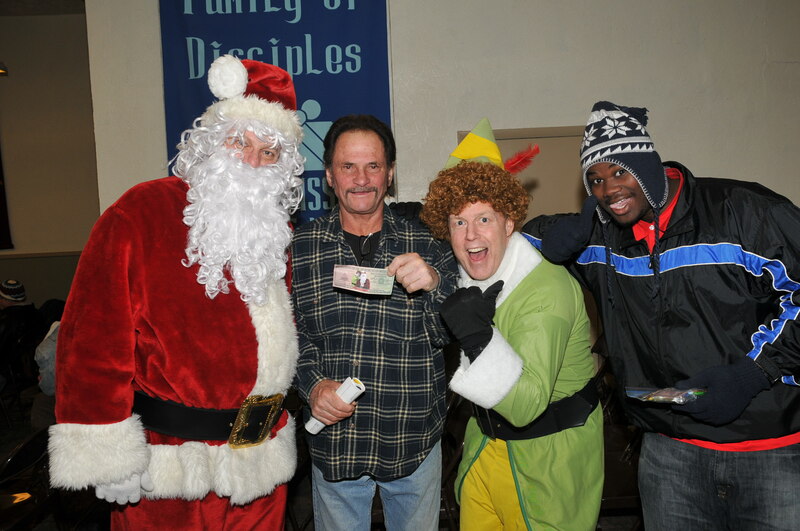 Each year since 2010, Buddy and Santa hand out packets with hand warmers, candy, mints, gum, and the Million Dollar Bill. Each year we increase the size of our donations, giving the mission dozens of used jackets, gloves, pairs of underwear (new), and other important items (conservatively valued by the mission at $400 in 2015). These are things desperately needed by the mission, especially during the colder months. 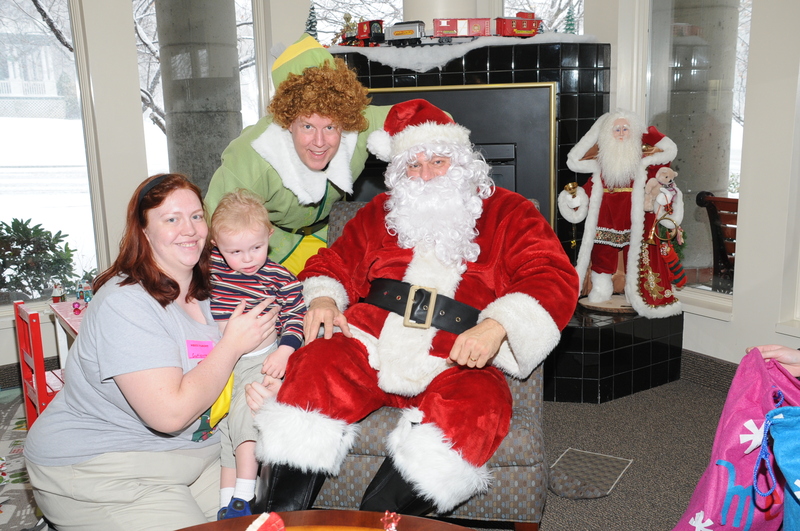 For several years, we made annual visits to the Ronald McDonald house in Salt Lake City, blessing the families who had children in the local hospitals. 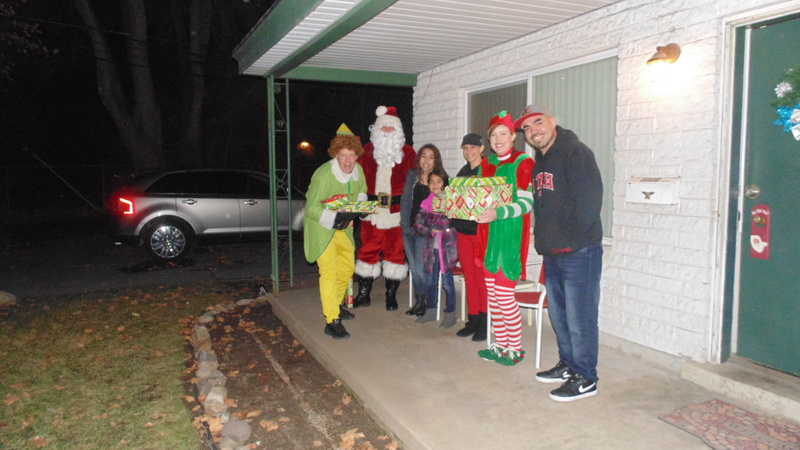 Santa and Buddy came with presents and a bright spirit to help spread cheer in what could be a lonely time of year for families. Every year we adopt a needy single-parent family or two. The day before Christmas we make our way from the North Pole and make a special appearance. 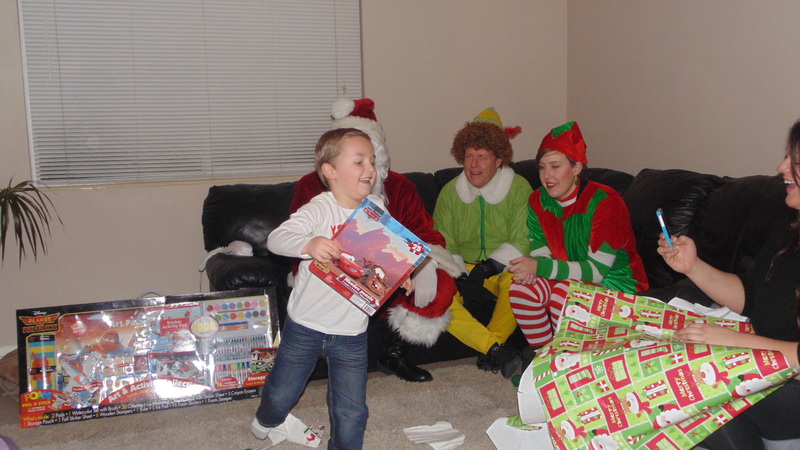 Imagine the joy of the child who is having his own personal visit from the Fat Man himself along with his trusty elf. In addition, we have visited low rent apartment complexes and randomly knocked on doors, to the squealing delight of the children inside. Santa brings a big fat Santa bag full of wrapped presents to give away. Your donations into our orange bucket make this all possible! 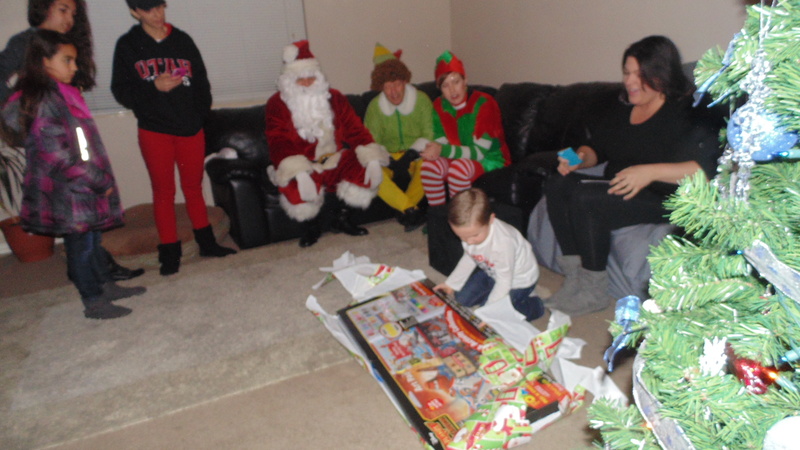 Below are pictures from the family we visited in 2014. These are just a few of the things we get to do with the donations, 100% of which is distributed to the delight of others! Thank you for your support of our efforts.